Originally printed on January 31, 2019 in the Exmouth Journal. JEAN BROWN. 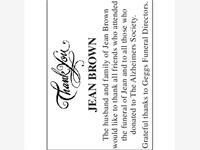 The husband and family of Jean Brown would like to thank all friends who attended the funeral of Jean and to all those who donated to The Alzheimers Society. 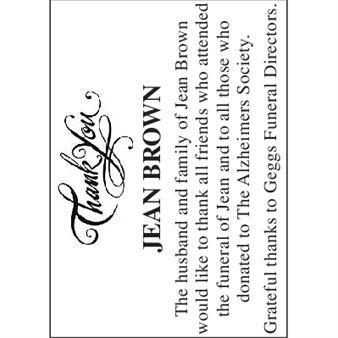 Grateful thanks to Geggs Funeral Directors.